Bea Bishop is about to get married to the dashing and successful Adam, but as she is walking down the aisle she spots her old boyfriend Kieran amongst her friends and family members in the pews. He disappeared eight years before after something terrible happened over the summer (what exactly this is we don't find out until further into the story) and so in shock over his sudden appearance Bea slips and falls. When she regains consciousness, two different lives take form: one where she married Adam and another where she pulled a runaway bride after catching a glimpse of her former lover. In alternating chapters the reader sees the two different paths unfold as Bea tries to come to terms with the choices she's made in the past. From the moment of the wedding Bea's two possible lives split into almost opposite directions, but as the months pass by it becomes evident that perhaps it doesn't matter what journey you take in life, because your destination may have been written in the stars all along. 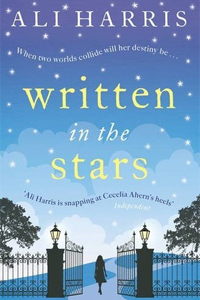 Ali Harris knows how to write a romantic story that is beautifully written and has a real feel-good quality about it, yet doesn't avoid difficult subjects such as mental health issues and complicated family relationships. Combining both the fun aspects of a romcom and the more serious side of life, this was a well-balanced novel and somewhat of an emotional journey for the characters and readers alike. After I recovered from the initial shock of Bea running away from her own wedding - in one of the two storylines at least - I instantly felt drawn to this wonderfully creative person who despite having everything going for her on paper, didn't feel happy with how her life had turned out. As cracks started to appear in the seemingly perfect version of her life where she did marry Adam, I started to understand what drove Bea to make that snap decision on her wedding day and it was a heart-breaking revelation. Though I felt more gripped by the story where Bea choose not to get married and first come to terms with her past before she could even consider making such a huge and life-long commitment to another person, I did also fall in love with Adam, who was ever so wonderful and amazing despite the sudden drastic changes happening in his own life. Adam is someone very special and I'm glad he didn’t just disappear after that disastrous wedding day, but played an important role in both versions of the story. Another thing I really enjoyed about this novel was Bea's love for gardening, which was born out of a desperate desire to connect with the father who left when she was a little girl. She has cherished the gardening diary he created for her, inspiring snippets of which are scattered throughout the novel, and even embarked on a garden design study – though she never finished it. While I'm not much of a gardener myself, I could feel Bea's passion popping from the pages. Most of all though, I was intrigued by the underlying message of two different paths leading to the same inevitable outcome; your destiny remaining a constant no matter what choices you make in life. It's a fascinating concept and Ali Harris has tackled it wonderfully, encasing it in a beautiful romantic packaging, which managed to make my heart flutter (and also made me brush away a tear, or two).